Fun With Frisian: GRAP - "joke"
Happy April Fool's Day! 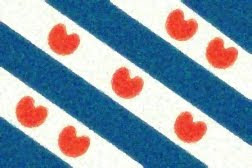 Here's a little West Frisian lesson to celebrate! The diminutive, i.e., a "little joke," is grapke, and the second syllable takes a schwa. (GRAWP-kuh). To "play a trick" or to "make a joke" is in grapke meitsje in West Frisian. (UHN GRAWP-kuh MIGH-tchuh).